What is it that keeps us going back to our favorite modes of entertainment? Whether it’s movies, books, video games, or all of the above, there’s something about entertainment that keeps us (and our wallets) always coming back for more. There are probably several reasons behind this phenomenon, but one of the principal ones lies in the fact that, if it’s good, we become immersed in the content. That immersion makes us feel like we’re part of the experience. We feel what characters feel and that, in turn, often causes us to think. Interactive infographics can create a similar engaging experience with your content. You can use interactive infographic samples as a guide to discovering what engagement is right for your brand. You could even say that in most entertainment, that immersion helps market and sell ideas. Content marketing aims to do something similar, but it can be more difficult without the narrative that creates immersion during a movie or throughout a book. Infographics help us close that gap between communicating information and immersing the reader or viewer. Visualizing ideas helps customers more than just reading them, and interactive infographics take that a step further by allowing for direct interaction. That interaction begins to immerse customers. But just like making a great movie is difficult, so is making an awesome animated infographic. Here are some great interactive infographic samples to help spark some inspiration as to how you can immerse your own readers and viewers. Not to toot our own horn or anything, but what better way to learn how to make a great infographic than with an interactive infographic that teaches you how to make infographics? Tired of that word yet? This interactive infographic sample allows you to easily scroll through helpful information at your own pace. The content and copy are both simple but aesthetically pleasing. Some think it’s best to cram a lot of information into one place, but doing so often has the opposite effect from what you may want. Forcing too much information into a portion of an infographic is like watching a movie that has so much packed into it that you can’t quite follow the core plot. Simple is always better, especially when readers and viewers are only looking at each part of your infographic for a few seconds. If there’s too much, they’ll simply move on. In this case, consumers are immersed as they scroll through the interactive infographic. One point builds upon another, much like the weaving of plot points in a narrative. It may not feel quite the same, but it can have a similar immersive effect. Where Will Your Next Home Adventure Take You? This infographic is a more practical example of interactive infographics in action. 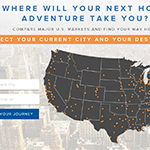 It presents a masterful display of how you can market your own services while setting yourself off from competitors, just like Homes.com does with the adventure created by this interactive infographic sample. Buying a house is often a stressful experience, but this infographic makes it feel more like an adventure. Starting with a map that prompts you to pick your destination makes you feel like you have the potential to go just about anywhere, like the possibilities are limitless. Plus, in many cases, when you click on a destination, the background image is an open road, another method of immersing the consumer, even if subconsciously, into the message of adventure. As you explore this interactive infographic sample, you can compare the housing market of the city you currently live in to the city you want to journey to. Once again, the information is presented with simplicity. It’s easy to understand but not dry and boring. And the information isn’t the only thing present. As you scroll, the images, piled up like family photos, make you feel like you’re on a road trip, which again reinforces the immersion. The infographic ends with a direct comparison of the two cities, which makes it feel like the infographic led you on a journey to a destination, just like buying a home will do. The “Entertainment in Riyadh” interactive infographic is a great mix of practicality and aesthetic, and it’s a good template for a business looking to draw tourists to their city. How does the infographic do this? By not only telling you what’s in Riyadh, but by taking you there. As you click on the different types of entertainment you’re looking for (such as food or family friendly activities), markers drop onto the map, which you can then expand to learn more. 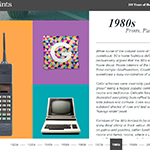 This interactive infographic sample immerses readers and viewers in a couple ways. First, having such an easy way to find both activities and locations allows the consumer to be immersed in their own plans. It makes a coming vacation more of a reality. The interactive map also has the potential to make tourists feel comfortable in a foreign place. It can make them feel like they know the city because the infographic immerses them in it. Sometimes, you aren’t really aiming to market or sell anything, but simply to inform. Interactive infographics are a great way to do that, too. Common MythConceptions is a constantly expanding infographic that features engaging and cheeky copy that accompanies simple images of common myths. The size of the myth image indicates the virulence of the idea as indicated by Google hits. Viewers can click on the many images, which will take them to sources proving that the information is a myth. But how can just presenting information be immersive? For one, these myths are relatable. We’ve all heard many of these (like the five second rule), and so we’ll evaluate where we stand in relation to the myth. Did we believe that? Or did we already feel like it was a myth? Either way, we can laugh at ourselves or have that nice feeling of self-satisfaction. The questioning combined with the emotions draw us into experiencing the infographic rather than just viewing it. We connect the information to our own personal story. 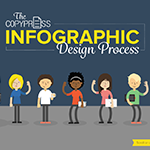 Now you’re ready to get started making an interactive infographic. 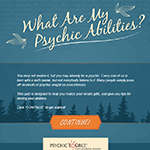 Find inspiration from our interactive infographic samples to create your own! Take your readers and viewers on a ride that leaves them wanting more. CopyPress can help you make your creative ideas a reality. Our designers and developers will make your interactive concept come to life. Contact us today to find out how! Homes.com Where Will Your Next Home Adventure Take You?